Saturday evenings during the month of March and April (excluding March 2), climb aboard one of our Sunset BBQ Dinner Trains. Tickets are only $40 per person, and include a two hour ride and your choice of the following entrees: Sliced Beef Brisket, Pulled Pork, Smoked Chicken, or a Grilled Portobello Mushroom topped with grilled vegetables. Meals are served with baked beans (vegetarian baked beans served with the Grilled Portobello Mushroom), potato salad, a fresh cornbread muffin, and the Chef’s choice of dessert. 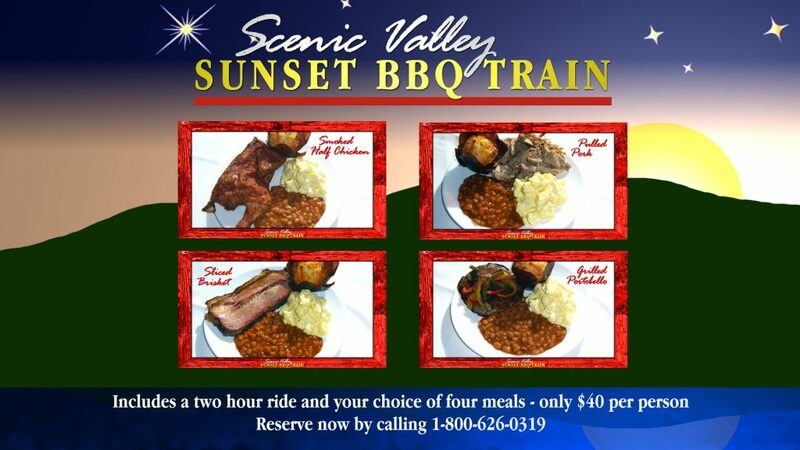 Fight the ol’ cabin fever, and join us for some great BBQ and a beautiful sunset while you travel in the climate controlled comfort of our historic 1950’s streamliners.